94.1 WHRP “Jazz Vision Jam” 10th Anniversary Food Drive Fundraiser – Sunday, April 28th At Reflections! 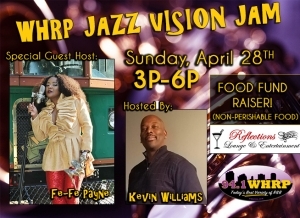 94.1 WHRP’s “Smooth Jazz and R&B Matinee” is celebrating its 10th anniversary, and we want you to join the celebration at a special “Jazz Vision Jam” – Sunday, April 28th from 3-6pm at Reflections Lounge And Entertainment (8694 Madison Blvd Suite R, Madison, Alabama 35758). Join host Kevin “The Nighthawk” Williams and special guest host Fe-Fe Payne for an afternoon full of great live jazz performances, prizes and surprises and more. Best of all, this special event will help support our community – admission to the event is free, but we are asking everyone attending to please donate canned and non-perishable food items to help support our local food pantries. ATTENTION AREA JAZZ ARTISTS – WE ARE EXTENDING AN INVITATION FOR YOU TO JOIN US AT THE JAZZ VISION JAM! If you are interested in having your band donate your performance time and talents to “Plug & Play” to help support Jazz Vision Jam and our Food Drive, please fill out the contact information form below.